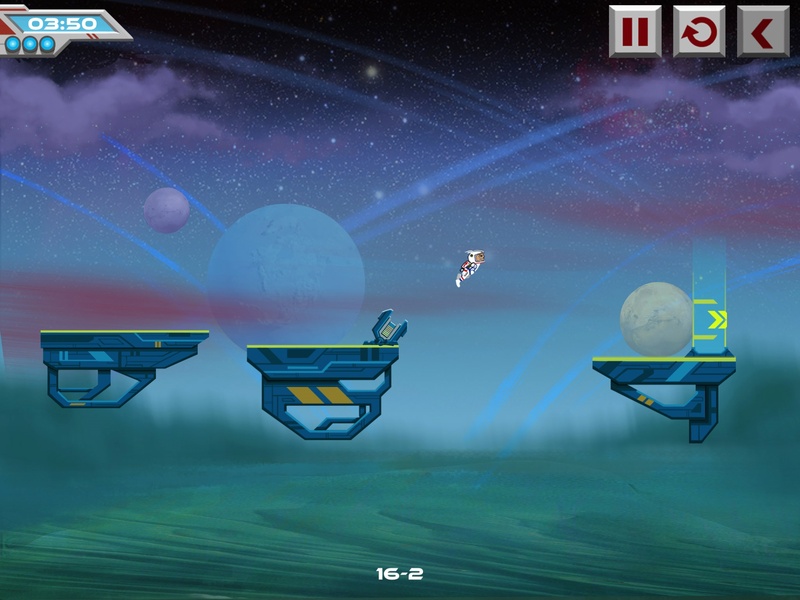 Galaxy Run is the latest game from Spiel Studios, who have previously brought us Propel Man and Slumber Sam. 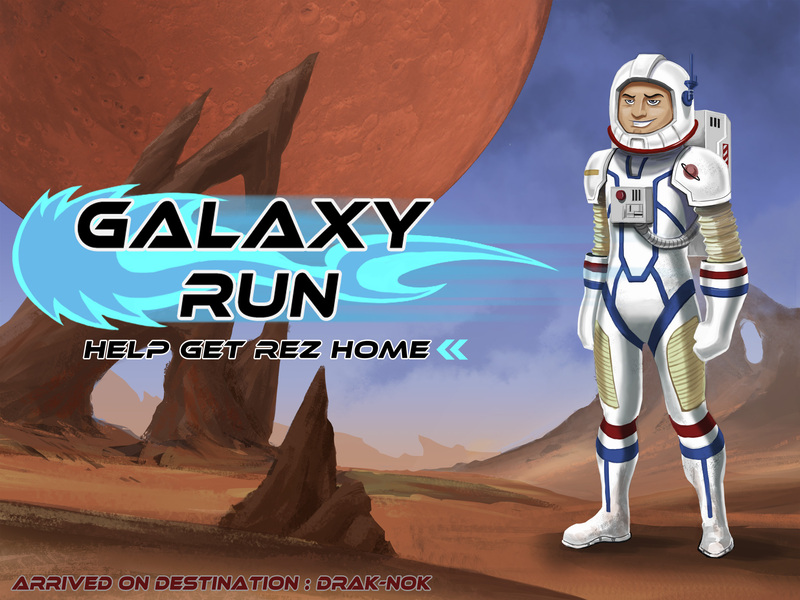 It’s a platformer that sees astronaut Rez navigating various obstacles across three different areas in his attempt to get home. 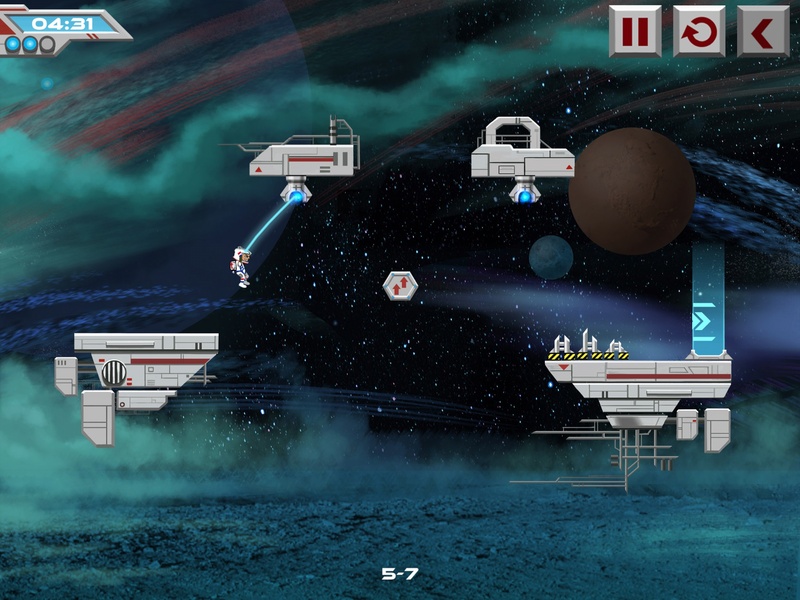 Galaxy Run is a fairly straight-forward game to play. When you begin a level, tap the touch screen to get Rez running, and tap it again to make him jump over gaps or obstacles. There are quite a few of these; from your standard spikes, to robots that roam back and forth across sections of the course. Obstacles can be made easier to avoid by using power-ups, of which there are three different types. The first slows Rez’s running speed down for a short time, making it easier to execute precise jumps. The second turns him invisible, so any obstacles he runs into won’t harm him. The third skips the level entirely, so you can move on and come back to it later. You are supplied with three of each of these power-ups when you first download the game, and are able to purchase more using real money if you wish. 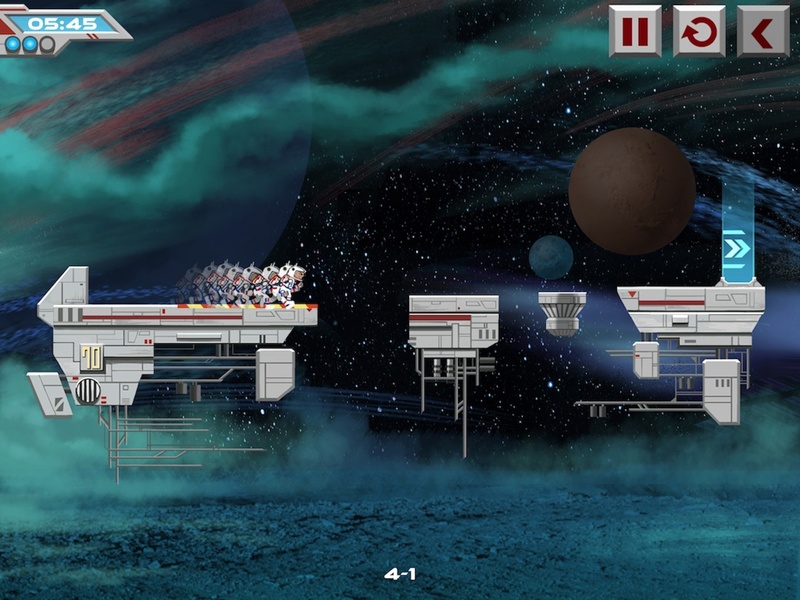 There are eighteen stages in Galaxy Run, each containing 20 levels, for a total of 360 levels. The first 15 levels must be cleared in order to unlock the next stage. The final five levels are “extreme” levels; these do not need to be cleared in order to reach the next stage, but exist as a challenge for those after something a little harder. And some of them are really punishing. If you’re wondering about playtime, it took me around 6 hours to complete every level, and I’m generally bad at platformers. Each day, nine new “bonus” levels become available to play for free. So if you’ve already completed the entire game, you still have some fresh experiences to look forward to. The developers did a great job of spicing up the gameplay, as every stage introduces a new aspect to keep things fresh. Some of my favourites were the warp panels and the items that shifted gravity; they really helped to add a puzzle element to the game which I had a lot of fun with. The second one, especially, which made Rez run across the top of the level instead of the bottom, really had me confused sometimes, which was great. Each level keeps track of your record time and assigns you a score based on your performance, with zero being the worst and three being the best. There’s also a percentage tracker in the top-right corner of the stage select screen which fills up as you clear levels and get higher scores, which will extend your personal playtime and increase the game’s replayability should you decide to attempt to get them all. Galaxy Run also adds a few things for convenience that I liked. Rez never starts running until you tap the screen, and this applies to when he lands on moving platforms as well; he’ll stop and wait for another tap before resuming his run. It also marks where you made your last jump, so you can plan your next leap. The art style and the music in Galaxy Run do the job, but aren’t really anything special; in fact, the music got quite repetitive after a while, especially in the extreme levels where I died often. I did encounter a minor bug in that, when trying to use the cannon (pictured below), the orange bar that’s supposed to show up inside it to indicate how far Rez will be fired wouldn’t show up. So my getting through stage 16 was entirely guesswork. I did contact Spiel Studios about this, who have stated that they hadn’t heard of such a thing happening before, but promised they would look into it and include a fix in the next update. I wasn’t able to find any mention of this bug online at all, so I do believe this is just an isolated incident. Galaxy Run is a fun game with some interesting mechanics. However, it is quite short, and there is little here for anyone who isn’t into platforming games. For those who are, it’s a good game for its low price of $0.99, and I would recommend you look into it and try it out.